SDI and HDMI are switchable between standard definition, high definition and ultra high definition. 1 x reclocked 10‑bit SD/HD/3G‑SDI, 6G‑SDI and 12G‑SDI. 2 x XLR. 2 x RCA HiFi. 1 x 6.5mm headphone socket. Stereo with 2‑way crossover and independent stereo subwoofers. 2 channels balanced 110Ω AES/EBU via XLR. 16 channels embedded in SD, HD and UltraHD 4K. 16 channels embedded audio loop out. 8 Channels embedded in SD, HD and 4K. 1Gb/sec for configuration and firmware updates. USB‑C for configuration and firmware updates. 2 x 27 RGB segment LED VU, PPM or Loudness meters. Push button interface allows for input selection, channel selection, independent left and right audio, mute and volume control with scroll wheel. 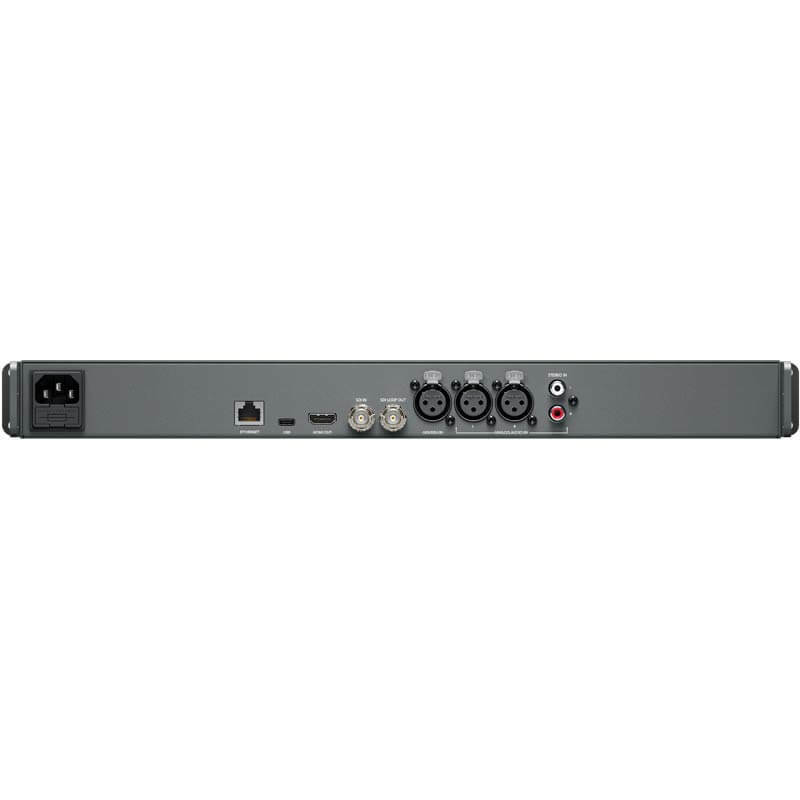 Blackmagic Audio Monitor 12G provides the finest quality audio monitoring in an incredibly small one rack unit size! Featuring a dual subwoofer design with extra wide range speakers for amazing audio, all backed by a super powerful class A/B amplifier. 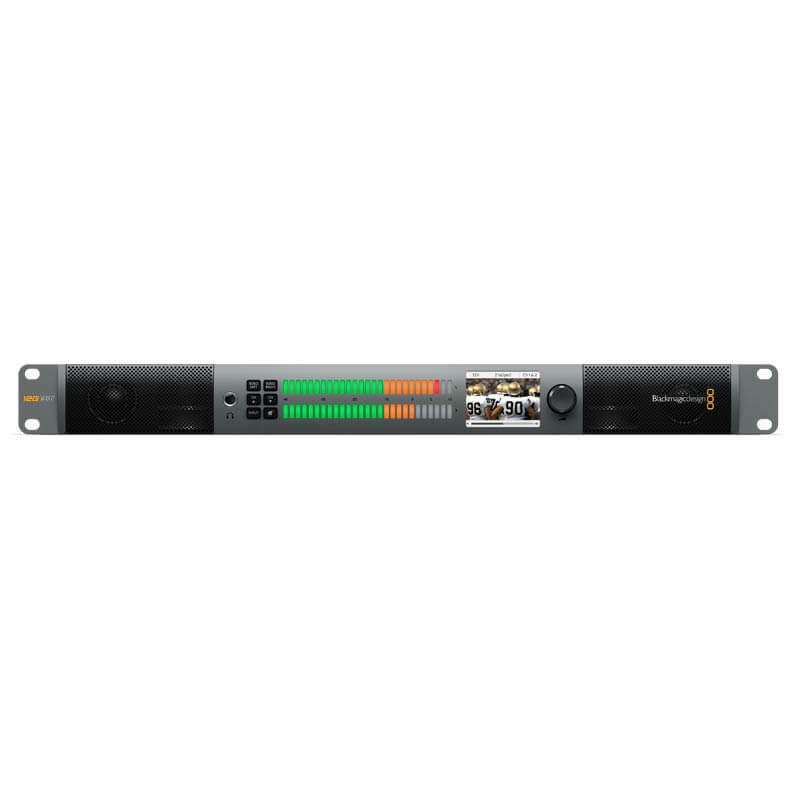 This precision audio and video monitoring solution includes an advanced 12G‑SDI input, as well as balanced XLR analogue audio, balanced AES/EBU digital audio and consumer level HiFi audio inputs. The elegant front panel has bright multi coloured audio level meters and a built in LCD for monitoring video sources, plus you get an HDMI 2.0 output for monitoring Ultra HD on big screen televisions. It’s never been easier to put the highest quality audio and video monitoring everywhere you need it. 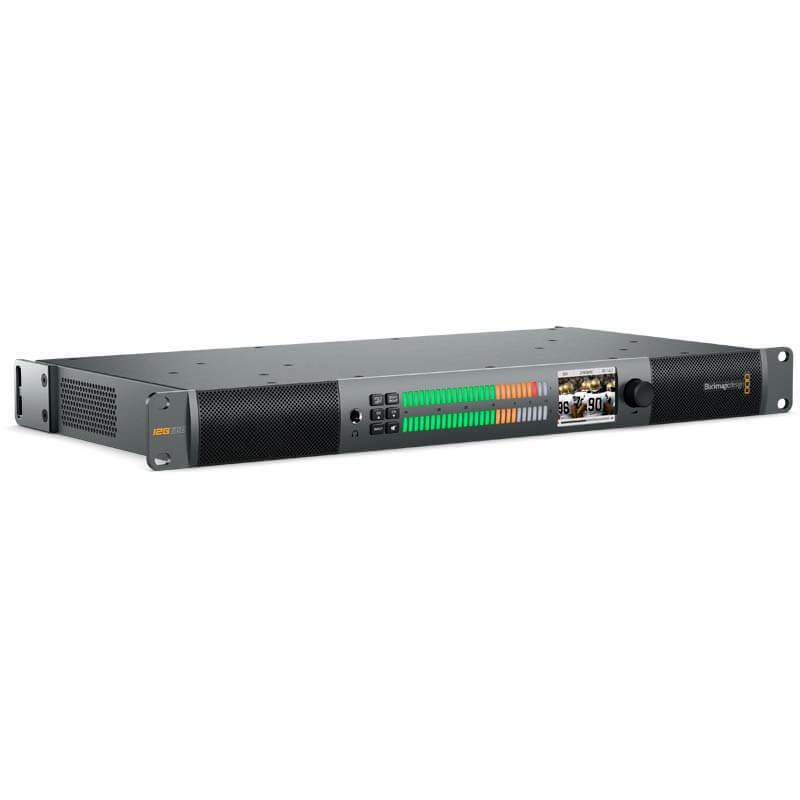 Install Blackmagic Audio Monitor 12G in broadcast racks audio on decks, video servers and live transmissions. At the push of a button you can switch between stereo pairs of the SDI input, great for monitoring alternative language tracks. The compact size is perfect for portable flyaway kits and broadcast trucks where space is tight, or in edit and audio post production facilities where precise audio quality is essential. The two big bright audio level meters on the front panel feature multi coloured RGB LEDs under each segment. You can select between VU or PPM or Loudness scales with a choice of EBU or BBC meters. With lots of meter segments you can monitor a very wide dynamic range, from -45 to +3 decibels, -12 to +12, or 0 to 7, depending on the scale you choose. In addition you can meter Loudness using standard Loudness, K‑weighted, relative to Full Scale (LKFS) to normalize of levels for delivery to broadcast TV and video. The bright audio level meters are always clear enough to read, no matter if you are working in bright or dark environments. 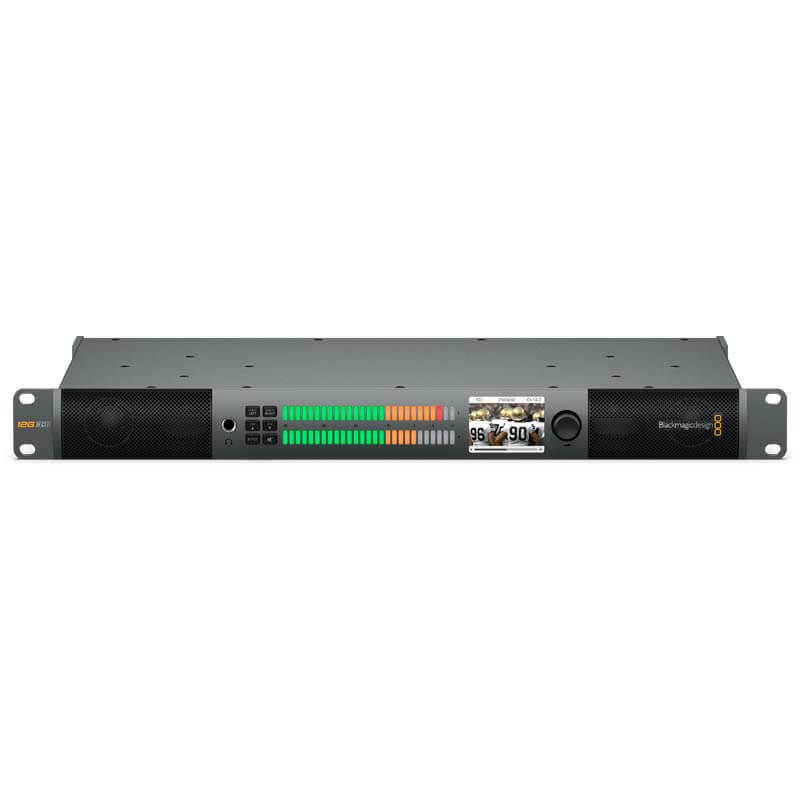 Blackmagic Audio Monitor 12G has all the audio and video connections you need to make it the perfect monitoring solution in any environment. With balanced analogue XLR audio, balanced AES/EBU audio and consumer level HiFi audio inputs it’s easy to connect any audio source. You can select between inputs quickly using the input button situated on the front panel. The 12G‑SDI video input and HDMI 2.0 video output both support embedded audio and let you connect to the latest high resolution video technology. When you're working with SDI video input you can use the Blackmagic Audio Monitor 12G to convert from SDI to HDMI for monitoring with big screen televisions or video projectors. Blackmagic Audio Monitor 12G automatically switches between SD, HD and Ultra HD formats. You can monitor in high resolution Ultra HD using the HDMI output with only a single HDMI cable.